406 W. 74th St. Kansas City, MO 64114. 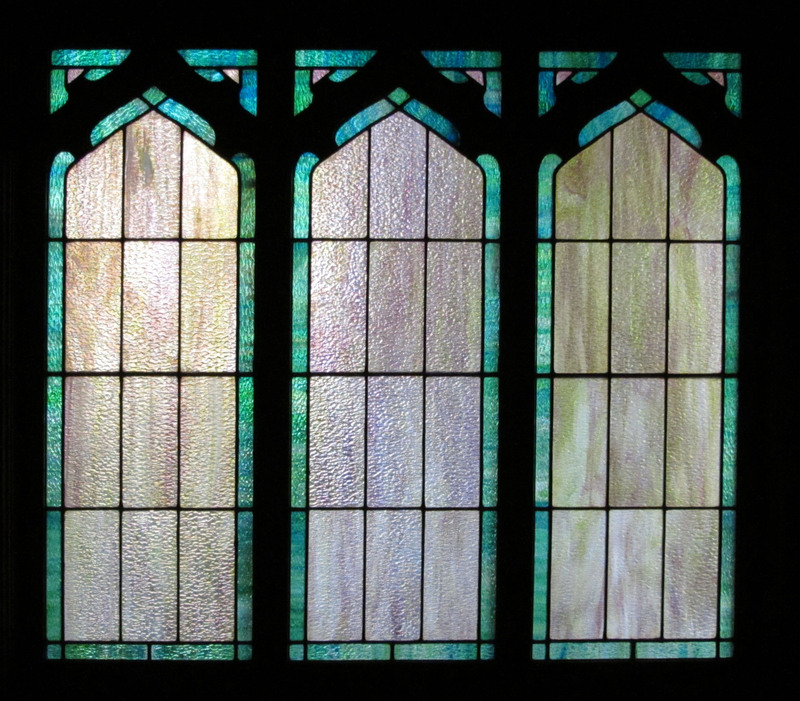 The northern and southern sides of the sanctuary contain four sets of three-paneled windows. 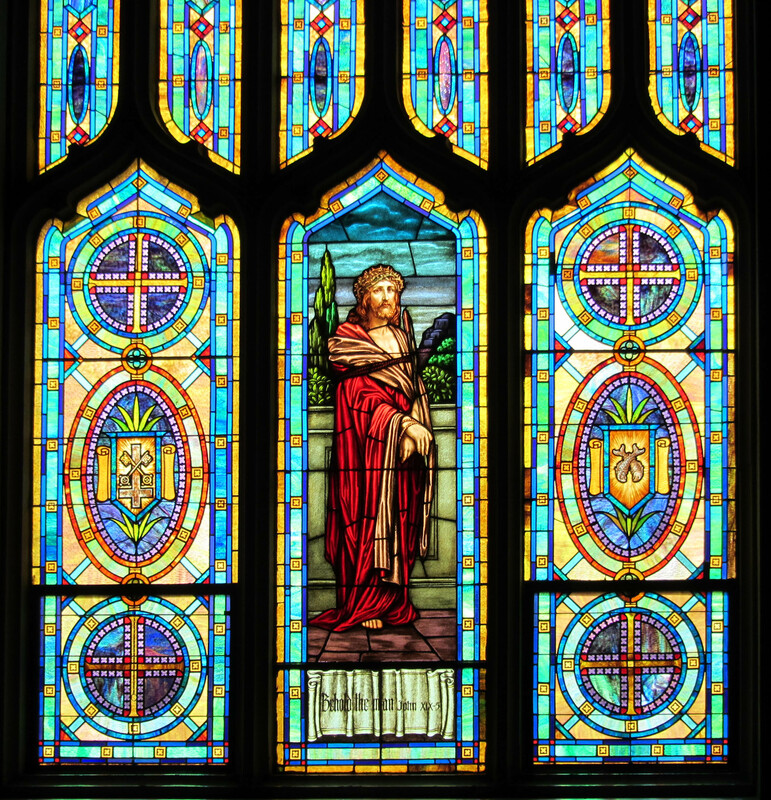 The central panels feature Christ at important moments in his life, while the panels on either side each exhibit a shield containing symbols representing attributes of a gospel writer or an apostle. 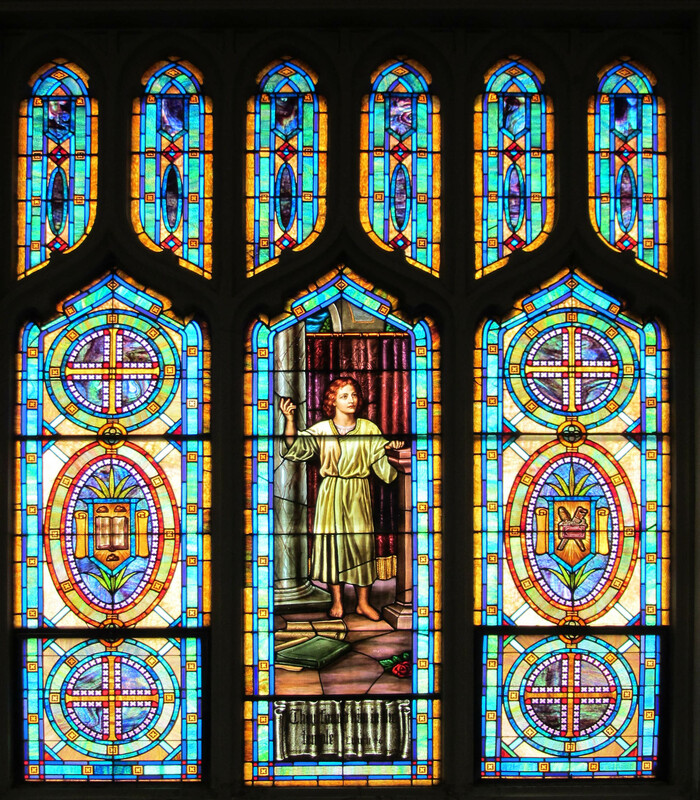 The first windows toward the east on both the north and south walls, those nearest the altar and the Ascension Window, contain shields of the gospel writers. Above each of the three main panels are two vertical, non-figurative windows. 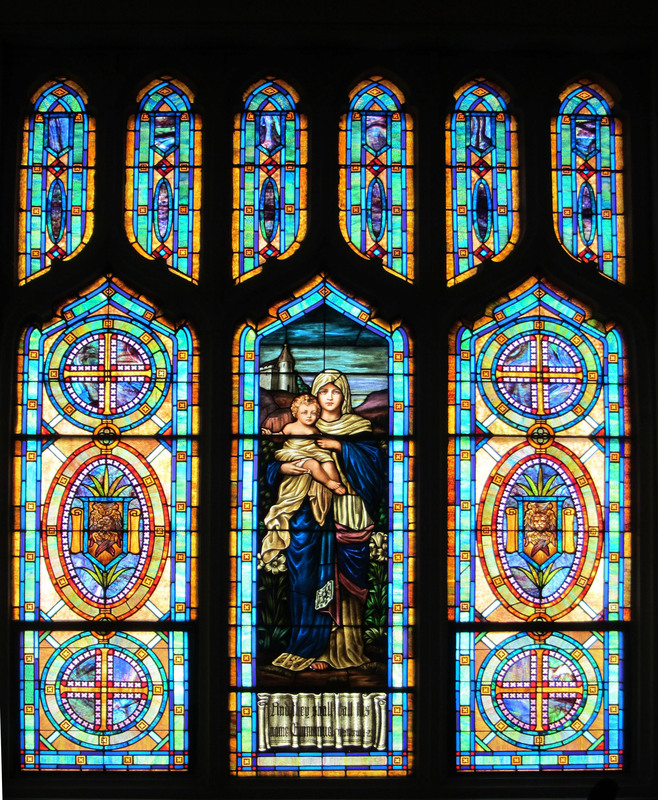 At the top and bottom of each side panel the designer has placed a cross within a circle, a recurring motif in all of the windows throughout the church. The redemption of Jesus is represented by the cross, and eternal life by the circle. 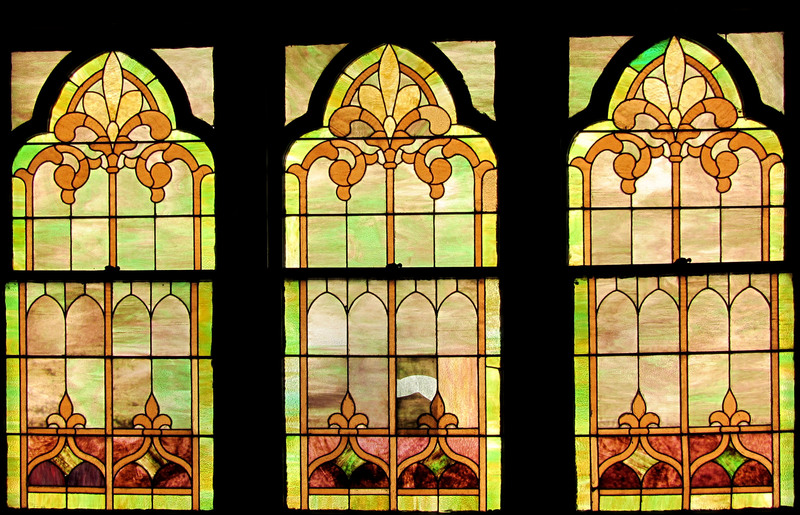 Thus each of the eight large windows actually is comprised of nine independent “lights” or windows. 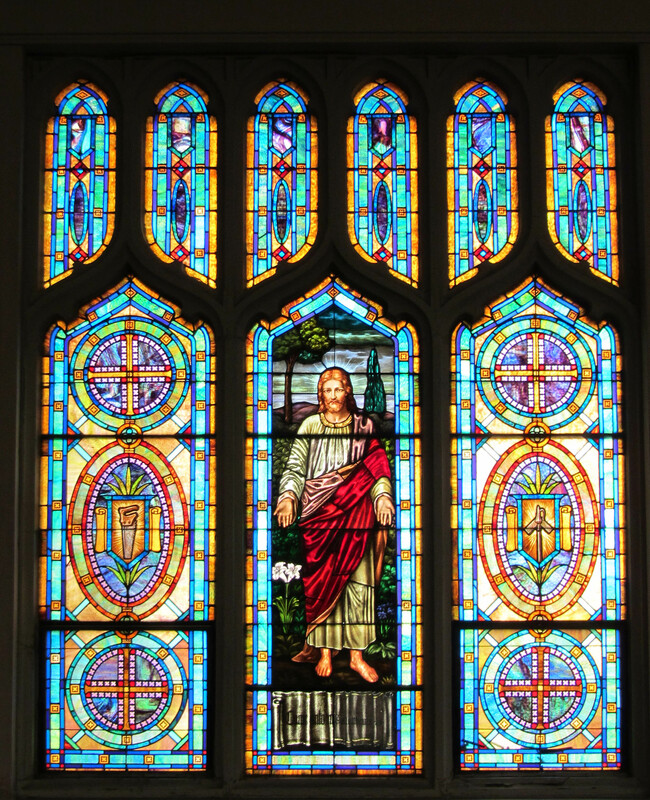 The following information about the windows in The Keystone United Methodist Church is based in large part on Worship Through Our Windows, a publication prepared by the church. I am also deeply indebted to Jim Mordy, a longtime member of the church who assisted in the collection of information for this study. 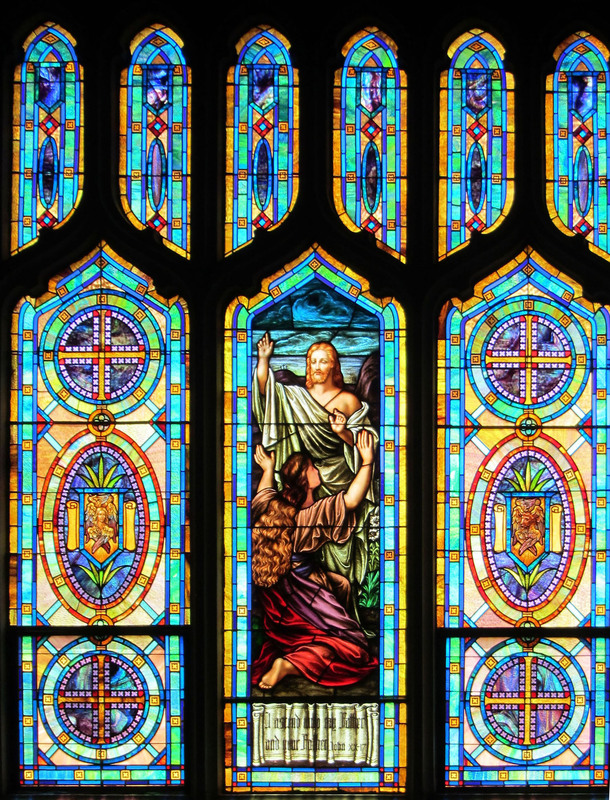 The windows on the South Side from the front are: (R1) I Ascend to My Father; (R2) Behold the Man; (R3) O Thou of Little Faith; and (R4) I Am a Light Unto the World. 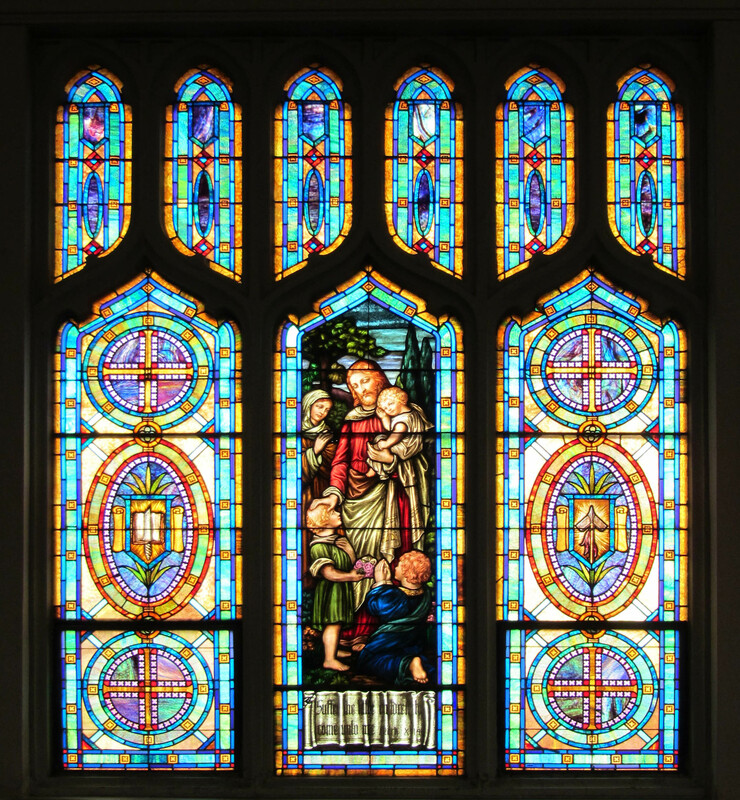 In the Center Front: (O) Is the grand Ascension Window in the English perpendicular style. The windows on the North Side from the front are: (L1) They Shall Call His Name Emmanuel; (L2) They Found Him in the Temple; (L3) Suffer the Children to Come Unto Me; and (L4) Come Unto Me. 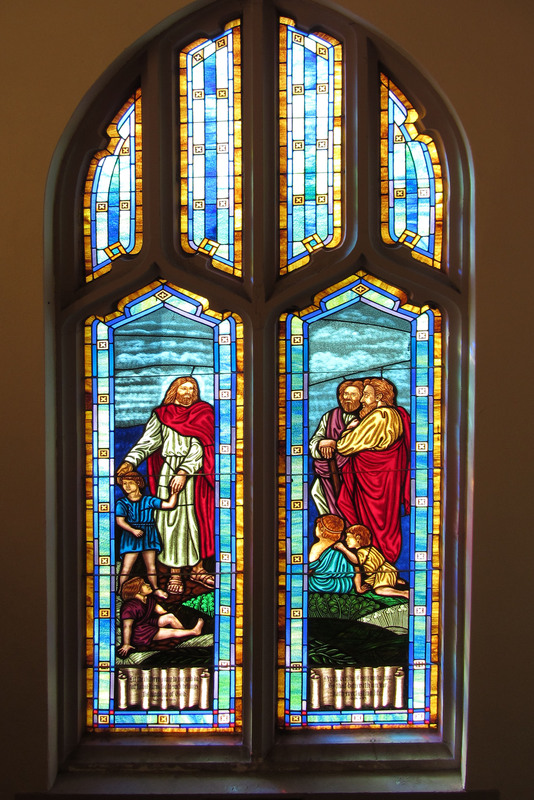 On the south balcony stairwell is a double-paned window (S1 ) Let the Children Come Unto Me and (S2) Verily I Say Unto You. Two additional non-figurative windows (S3) and (S4) are also in this stairwell. 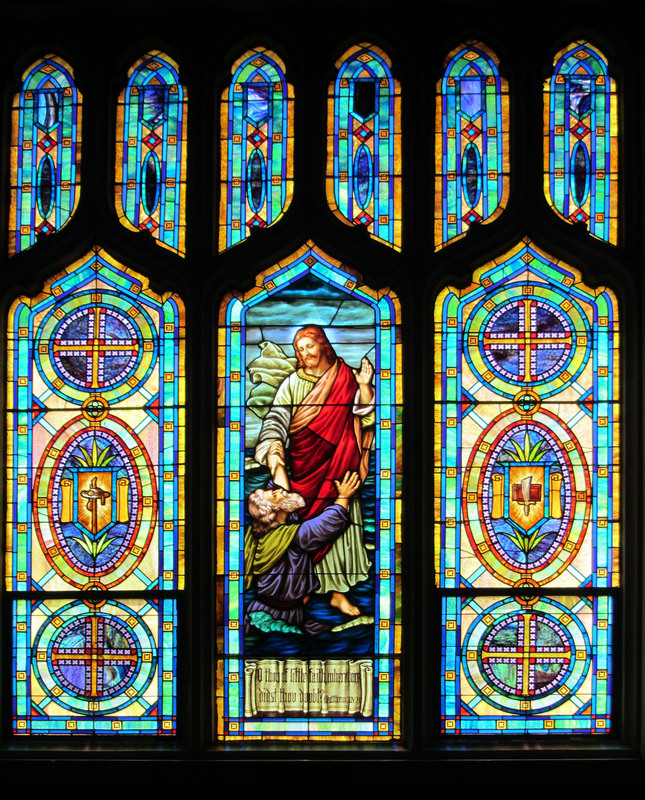 There are numerous non-figurative windows throughout the church building. Six triple-paned non-figurative windows (F1-6) are at the rear of the Sanctuary, along with eight double-paned windows (F201-208) of the same design which are at the rear of the Sanctuary balcony. An additional ?? non-figurative windows (C1-??) are located in the community room and in other locations. 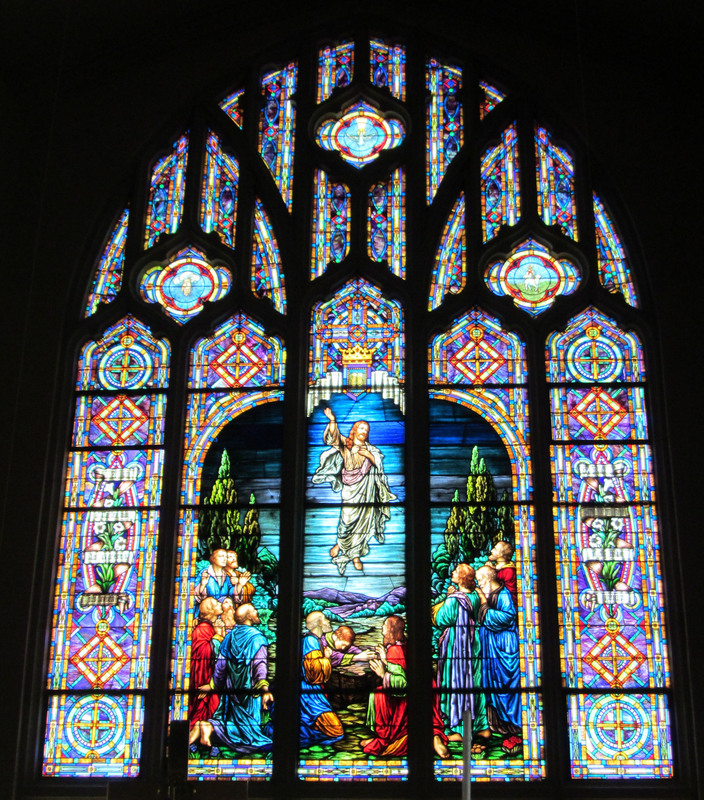 The ma gnificent Ascension Window fills the east wall of the church sanctuary. The three upper designs represent the Trinity. The open hand on the left symbolizes God, the descending dove in the center indicates the Holy Spirit, and, on the right, the lamb with the banner of victory stands for the Lamb of God and the sacrifice of the lamb of Calvary. There is a crown above the head of Jesus representing his sovereignty and his victory. Below the crown are alpha and omega, the first and last letters of the Greek alphabet, meaning Jesus is the first and the last. Lower on either side are lilies, which stand for purity and innocence. The Easter lily represents the resurrection of Jesus. The circle, the square and the cross appear in various forms and are present in numerous locations throughout the window (and throughout the church). 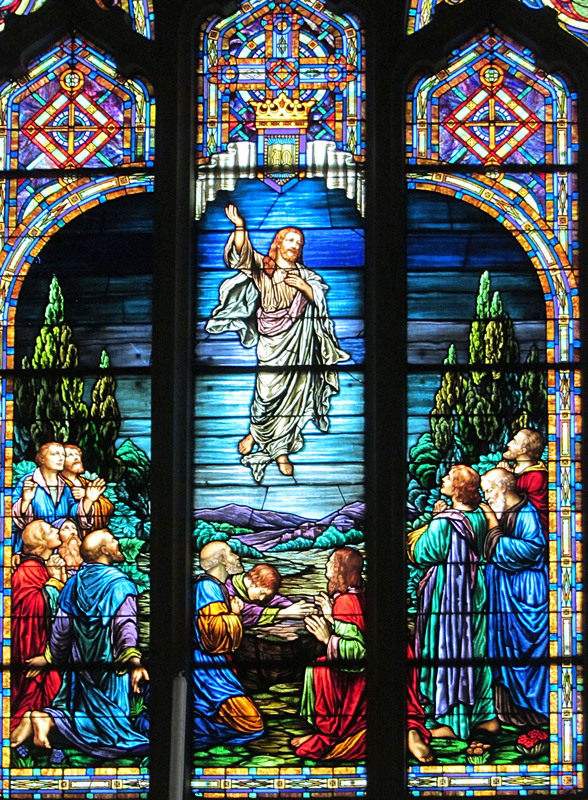 In the center is the Risen Christ being watched from below by his apostles. Central Panel: Mary with the infant Jesus. Left Panel: Matthias, who was chosen to take the place of Jesus, is said to have been stoned and then beheaded after missionary work in Judea. In this shield the open book represents his faith, the stones the manner of his death. Central Panel: Jesus as a youth teaching in the Temple. The book represents the law and the red rose, a foreshadowing of his martyrdom. Right Panel: James the less, is remembered with a fuller’s bat, a saw, and a fish on top of a book. This shield recalls his martyrdom. In memory of my mother, Mrs. Louise Wahrenbrock, by O. A. Wahrenbrock. Left Panel: Bartholomew: The open Bible and the flaying knife recall his faith in God’s word and his martyrdom. 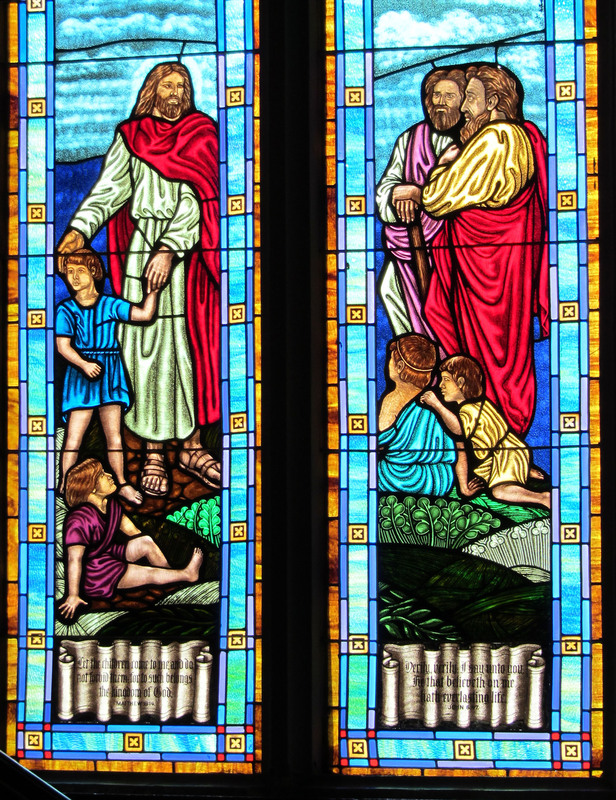 Central Panel: Jesus greeting and holding the children. He says The kingdom of God belongs to such as these. Right Panel: Thomas: The carpenter’s square and a vertical spear represent this apostle. He is the patron saint of builders. The spear reflects the manner of his death by a pagan priest. Given in loving memory of Leone Elizabeth Arneson, by her parents Louis and Myrtle Arneson, and her brother and sister, Clifford and Aileen. Left Panel: Simon, the Canaanite, and the companion of Jude on his missionary journeys, is represented in his shield by the saw, said to reflect the manner of his death, being sawn asunder or beheaded. Central Panel: Christ and the lily. Right Panel: Thaddaeus, also called Jude, traveled with Simon on his missionary journeys. The square and the boat hook in his shield represent his travels and work in building for the Church. Left Panel: Matthew, for whom the winged man represents the apostle who began his gospel by tracing the human descent of Jesus and continually stressed his manhood. Central Panel: Jesus with Mary Magdalene. He says to her Do not hold me…Go to my brothers and say to them I ascend…. Right Panel: Luke, for whom the winged ox represents the atoning sacrifice of Christ. Left Panel: Peter, whose shield includes the inverted cross, depicting the manner of his martyrdom, and the keys, representing the comment of Jesus about the keys of the kingdom being committed to Peter and the Church on earth. Right Panel: Andrew, whose shield includes two crossed fish, recalling Andrew’s original occupation and his call to become a fisher of men. Left Panel: James, whose shield depicts a wallet, an escallop shell and a staff, all representing a pilgrimage. Middle Panel: Jesus with Peter during the storm. Right Panel: Matthew, whose martyrdom was being crucified and beheaded with a battle ax, is represented by symbols of his martyrdom and a book signifying his devotion. Left Panel: John, whose symbol is the chalice of poison out of which issues a serpent, is based on the attempt to slay him, but from which the Lord spared him. Center Panel: Jesus as the one knocking at the door waiting to be greeted by one who lets him in. Right Panel: Philip, whose symbols in this shield include a basket, the patriarchal cross, a slender cross and a spear, was stoned, crucified and run through with a spear. 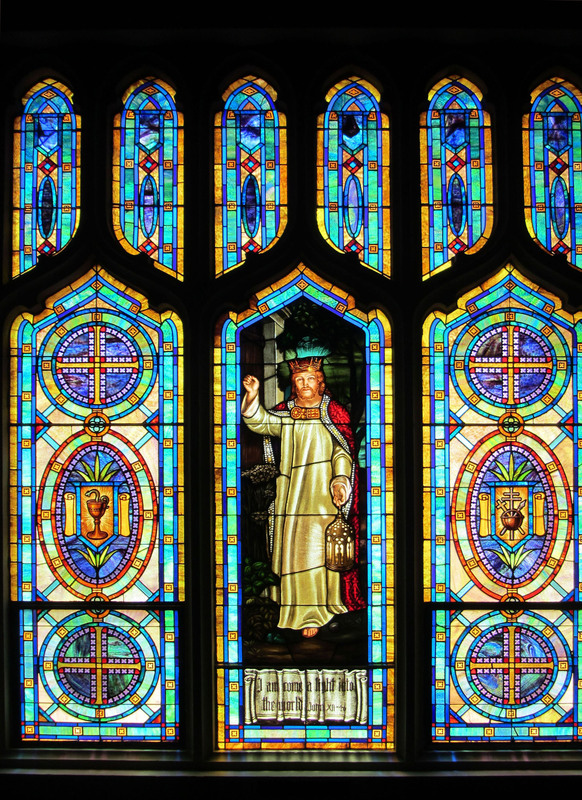 The “A Light Into the World” widow is an excellent example of the use of a previously created work of art as the source for the window’s figural element. The window’s figurative element is clearly based on a painting by William Holman Hunt. Also, there are 6 triple paned windows (18 lights) at the back of the sanctuary (F 1-6) and 8 double paned windows (16 lights) of the same design (F 201-108) at the back of the balcony. Additional windows are in the stairwell to the balcony and in the small rooms off the main sanctuary.